1890 Old Victorian Era Memorial Funeral Card. Black with Gold Tone Lettering and Illustrations. 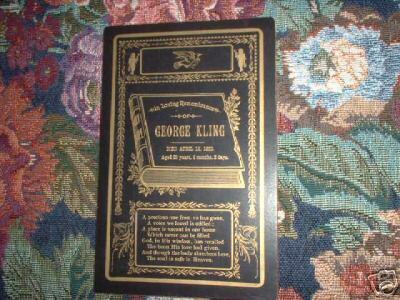 "In Loving Remembrance Of George Kling. Died April 18, 1890. Age 29 Years, 6 Mons, 2 Days." On the reverse side is printed: Copyright 1889. National Memorial Company. Philadelphia PA.